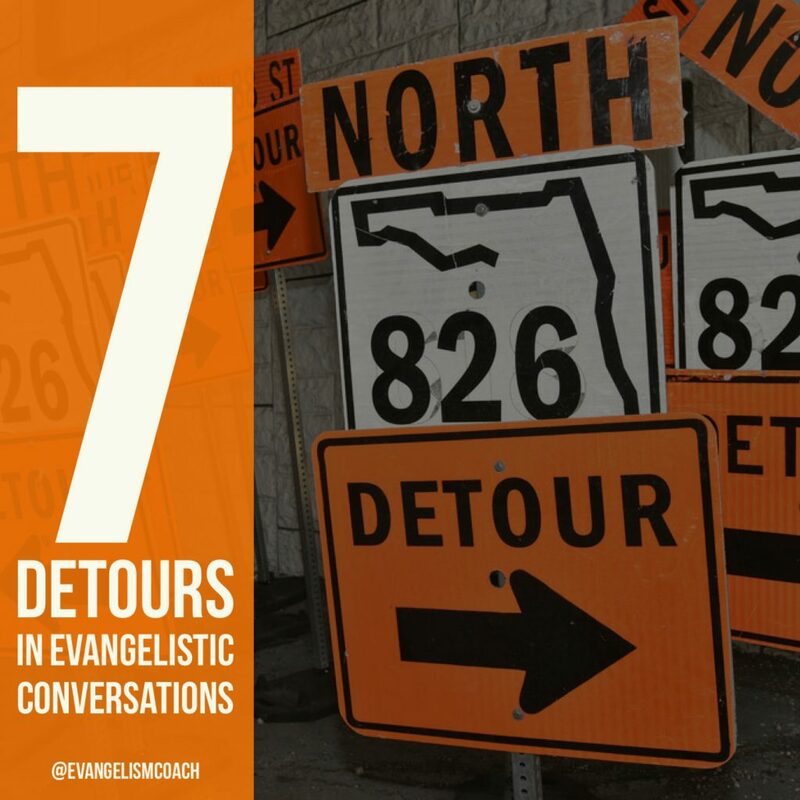 In a recent Outreach Magazine article (Nov/Dec 2012), Larry Osborne put together a list of 7 detours in evangelistic conversations. 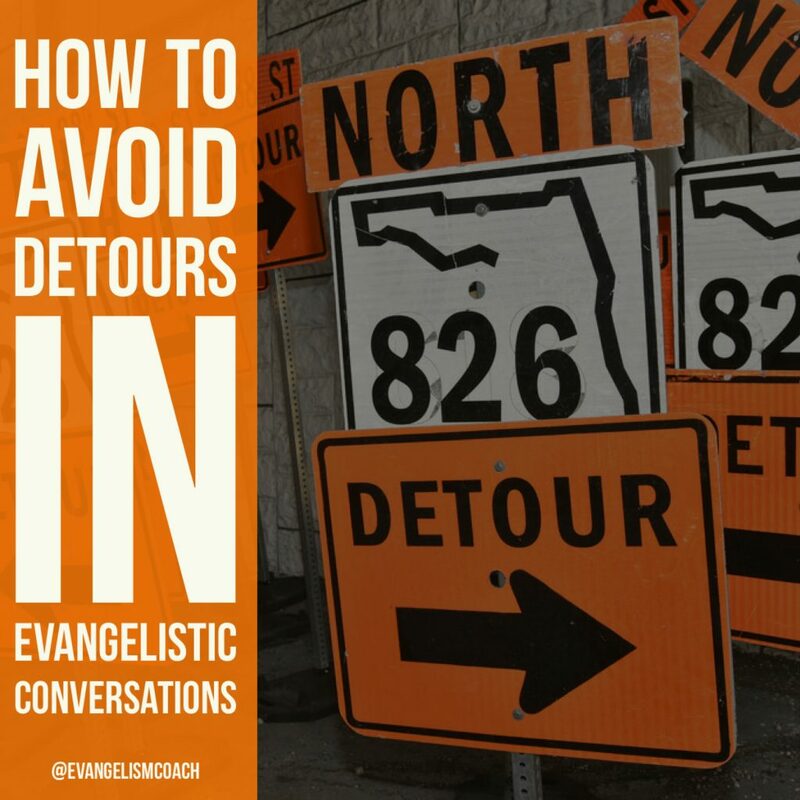 Detours are conversational rabbit trails that are deflect significant evangelistic conversation elsewhere, rather than at the true spiritual need of others. feel responsible for someone else’s response. Our goal is to be understood, not brilliant. Our objective is to be persuasive, not impressive. — Larry Osborne. Osborne gives a simple list. I’ve stepped into each one of these over the years, though I am getting better at avoiding these detours. Over the past several years, I’ve chased the personal evangelism conversation rabbit trails many times. As one with two seminary degrees, I step into number 3 the most. Early in my Christian walk, I got caught up in end times speculation, even imagining locust descriptions in the book of Ezekiel were attempts to describe helicopters. That was the only subject I would talk about and people thought I had lost it. I’ve mellowed out a bit on that one. I have seen people redirect conversations away from their spiritual need, avoid the topic all together, or simply change subjects to the weather. Paul spent nearly two years having evangelistic conversation with Felix. Acts 24 gives us a glimpse of it. Felix had some level of spiritual curiosity, and some working knowledge about the followers of Jesus (Acts 24:22), even if it was only on a political level as the movement of Christianity spread. Paul and Felix discussed Jesus and what it means to follow Jesus. I can imagine that Felix even experienced the convicting work of the Holy Spirit in some of those conversations. Even if there were some hidden motives for hearing Paul (like bribery – v. 26), Felix still got to hear of Jesus and the implications of being a disciple of Christ. These faith sharing conversations went on for the next two years (v.27). How to avoid evangelistic conversation detours. In the Outreach article, Osborne goes back to the one irrefutable argument in personal evangelism: your own story of your relationship with Christ. Sharing your conversion journey and stories from your own walk of faith is something no one can argue with. No one can argue with the transformation and difference that Christ has made in your life. No one could argue with the lame man at the Gate called Beautiful (Acts 3) who was lame but now dancing. No one can argue with the transformation that has happened in your life. Which conversational detour have your stepped in recently? Is there another one you would add to this list?